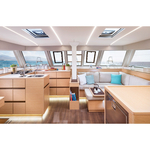 In 2018 has been manufactured vessel Nautitech 46 Fly called Margeo XIII. This sailboat is placed in marina Athens just a few kilometers from Athens in Greece. You can board up to 12 pax on the vessel Margeo XIII. Arrangment of beds is 12. 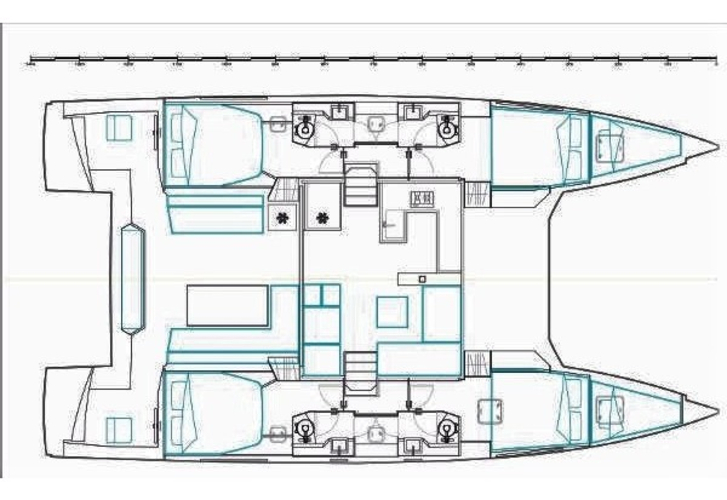 There are 6 cabins placed below sailboat's deck. Margeo XIII has 4 WCs. Browse for other yachts by clicking on this link: Catamarans Athens. Tank for fuel is 600.00 l liters capacious , water tank has up to 600.00 l l. In this sailing boat is installed motor 2 x Volvo 40 hp. 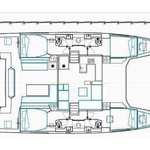 With 13.71 meters of lenght overall and 7.54 m of width Margeo XIII provides enough space for comfortable sailing. Nautitech 46 Fly Margeo XIII is equipped with: 2 refrigerators, Autopilot, Plotter gps in cockpit, Bimini top, Dinghy, Hydraulic gangway, Wc pump electrical, Mainsail with lazy jack, Inverter 12v-220v, Solar panels. . Security caution has value 3000.00 EUR. Use our website to find other vessels by clicking on this link: Catamarans Athens.